What do you do if a leaky ball type single lever faucet needs repair and you don't have a repair kit yet? Well follow these quick tips and you'll probably be able to stop or at least reduce the leak until you can get to the hardware store. 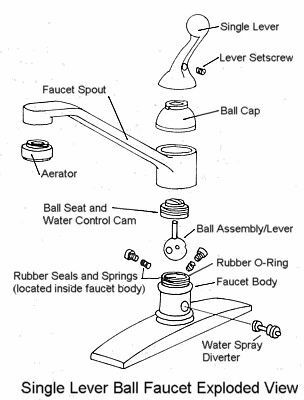 These faucets leak as the spring loaded rubber seals dry out, the springs weaken, the rotating ball acquires buildup or the rubber o-ring dries out. Reassemble in the reverse order you took the faucet apart.